Have you ever got your phone freezes when you use it? For those of you who have, of course it becomes very annoying for you especially if you’re using it for a purpose that is important. It would be greatly impede your work, right? Usually the cause of your phone become freeze is the number -application in your phone or the number cache on your phone. But you don’t have to worry about the problems if you use the Samsung Note 5. With the Galaxy Note 5, you can overcome various problems that usually occur on the other smartphones easier. However, many people who already know how to reset it and instead a lot of people who don’t know how to clear the cache on the Note 5. 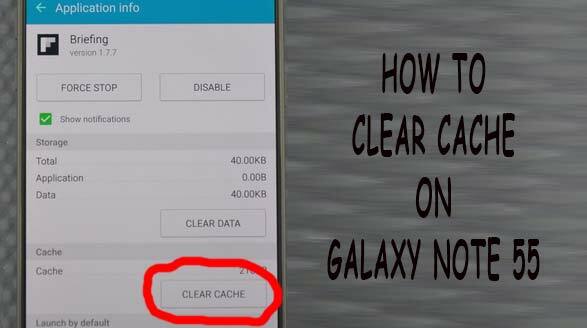 Before you do the deletion cache on the Galaxy Note 5, you must understand what it is cached. So, what is the cache and what does it do? Samsung Note 5 has two types of cache. The first is the application cache and the other is a system cache. This cache allows data to be stored temporarily to help better when switching between applications. Meanwhile, the system cache on the Galaxy Note 5 do the same thing, but for Android software instead of each individual application. That’s why when there is a problem of freezing, the best way to do is to delete the system cache lap to help fix this problem. For those of you who don’t know, here’s how to do it. Select the app you want to delete the cache for. Select Clear Cache. To clear the application cache for all applications, go to Settings and tap Storage. Note: If you choose Cached to delete all the data cache applications simultaneously, don’t select “Delete Data” unless you want to lose all the information that store applications, such as your user name, password, the progress of the game, preferences, settings, and so on.